01. Pool Party: It was summer time and I was 16 and carefree, I had a group of friends over at my place and we were just hanging out at night in the pool. Growing up we always had a pool and I was well rehearsed at doing all sorts of semi-dangerous things and getting away scot-free. We used to surf on boogie boards from one end to the other, jump off the roof, play hours of marco polo and chasey and enter the pool in any way imaginable. I thought when it came to water I was invincible. It was my idea then, of course, to have a back-flip competition. I was the first one up, this was something I had done hundreds of times before, but on my way back around, I clonked my head on the stone lip of the pool. Ouch. I swam to the edge and got a friend to inspect my skull to see if there was anything wrong. He couldn't see anything because it was so dark out. But then I heard him say "uh Karen" and I looked over at him and he was holding his hand up, which was covered in my blood. Oh no. Luckily my parents had arrived home, and managed to make it into the laundry only dripping a little bit of blood on the carpet (Sorry Mum) and Dad wrapped my head up, and we headed down to the emergency room. I came away with only 3 stitches, and feeling pretty dizzy. The worst mistake of course was deciding to still go surfing the next day. 02. The Swimming Teacher: For almost two years I worked as a swimming teacher. I got such a variety of kids to teach, from stage 1's who wouldn't even stick their heads under the water, to teaching teens and adults their bronze medallion. I loved working in the outdoor pool in the summer time and just jumping in when it got too hot. I hated working in the outdoor pool when it was cold and raining and I was shivering but still needed to get in and help the kids who just couldn't hook their feet doing the breaststroke kick. My favourite part of being a swimming teacher though, was when it clicked. When a child is trying so hard, and you work with them, and work with them, and try different techniques and keep trying to think of creative ways to help them understand what they are supposed to be doing, and then after what feels like forever, they get it. They stand up and are grinning from ear to ear, and I am so excited and I'm yelling "Yes, you got it, you got it, high five, now do it again!" 03. Paraplegics Paradise: Better known as Para's this place is dangerous, but every summer when we were on holidays for as long as I can remember this was one of our favourite beach locations. The reason it is called Para's is because the waves are big, and strong and break directly onto the shore. Even though we had heard many stories about neck and back injuries (thus the name) that had happened here, the place was still full of people, searching for a thrill I guess. We would rush in when the waves had a bit of a lull, and swim as fast as we could out the back. It was ridiculous to even consider using a body board or body surfing, although many people do, and get plunged into the sand within milli-seconds. I often would stay out there for ages, not because I liked it, but because I could never find the right time to get back in without getting pummeled by the waves, which of course inevitably happened quite often, and we all walked away with saggy bather/swimsuit bottoms that were full of sand. I still go down there on holidays, except I no longer take the risks the kid me used to, gotten soft in my old age I suppose. 04. Swimming Carnival: We used to have school swimming carnivals, and although this doesn't pertain directly to me swimming, it happened at a pool and we were all in our swimsuits so I figure it fits. It was in high-school, year 8 or 9 I can't really remember. Anyway, there was this guy, we had kinda gone out for a little bit, and now weren't really on great terms, but I was trying to be nice, and offered him some of my soft-drink (soda). When I turned around with my back to him, he poured the drink over my head. Without even thinking, I turned around and punched him right in the eye, he fell over backwards. Although I don't think I hurt him that bad (he did have a bit of a black eye after wards) I think that it was more his pride that was hurt, the fact that he got punched in the face by a girl. I was able to jump in the pool and wash the drink off my body. I was doing kickboxing classes around the same time, so probably another reason my first instinct was to punch first, talk later. 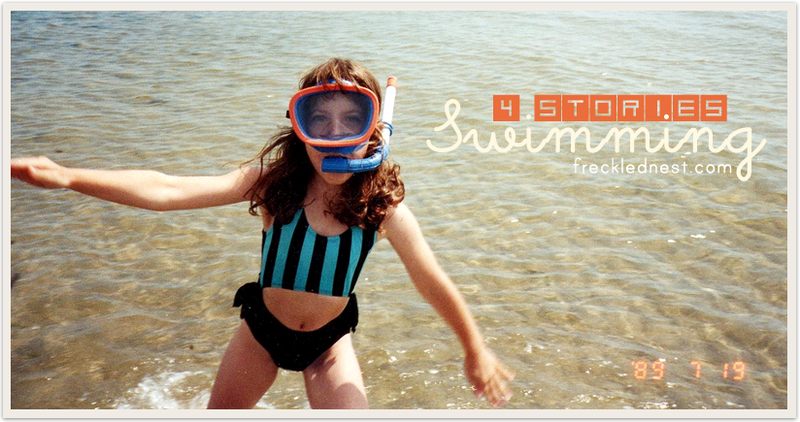 4 comments on "4 Stories: Swimming"
You write really well! I too liked the story about the thrill of your students finally "getting it". I also liked the "punch first, talk later"!!! Thanks!! I appreciate the encouragement!